As I plan my return to Peru, the usual quandaries arise. Do I go light, as I did last time – which opened up a whole world of backcountry possibilities, but proved a logistical challenge when it came to packing my laptop, and carrying more than a few days of food. Or, do I allow myself some extra luxuries, take the weight of my bike and tow the Tout Terrain Mule trailer instead? Right now, I’m playing around with a few other ideas; ways to travel pannier-less, yet still carry the tools I need to be keep me working on the road (namely, my DLSR and laptop). On my previous travels in Ecuador and Peru, I carried my laptop in a backpack – which was ok, but (in all honesty) not something I’d do again. If going light proves the way to go, then I’ll most likely change to a ‘traditional’ saddlebag. A little ungainly for bikepacking (the shape’s somewhat awkward for hike ‘n bikes), my Carradice Super C fits an 11in Macbook Air perfectly – hence my recent experimentations. For the last couple of months, I’ve been trying out a Bagman2 support, which hangs neatly off the saddle rails and mounts to the seat stays for extra sturdiness. This weekend, I figured I’d try attaching the saddlebag to my handlebars, supported by a small chromoly steel Nitto M18 rack I already owned. Weight-wise, there’s a definite penalty over my Porcelain Rocket handlebar pack. But on the plus side, Carradice saddlebags are famously tough and robust. Especially handy for a camera, the Super C is quick to access thanks to plastic buckles (compared to prettier but more fiddly leather straps). For now, I’m filling it with light, bulky clothing to provide padding for my camera, which sits on top, with a spare lens slotted in to one side. And, it’s almost completely waterproof. In the event of a downpour, a dry bag should be enough to keep the contents bone dry. It’s a great bag, and should last a lifetime. Performance wise? So far, so good. After a three day tour – across the whole gamut of terrain – it’s looking like an effective solution, offering easy access to my camera and lenses, while providing some much needed extra carrying capacity. I’m happy with the way the bike handles too. Weight up front slows down the steering, but I’m used to it now, and find it reassuringly predictable. Cinched in tight, the bag stays snug to the rack and bars – no flopping around. 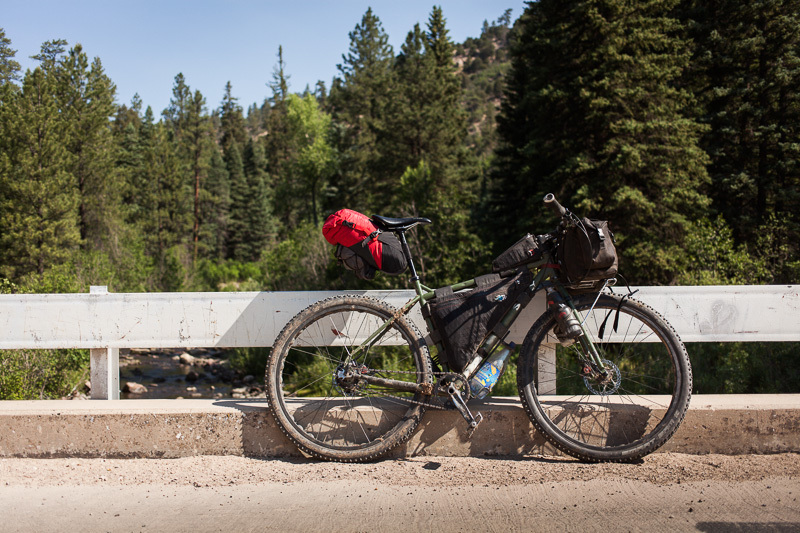 It’s not the setup I’d choose for pure bikepacking, but as my travels will likely range in road surfaces – from paved to dirt to singletrack – it may well be just the ticket. 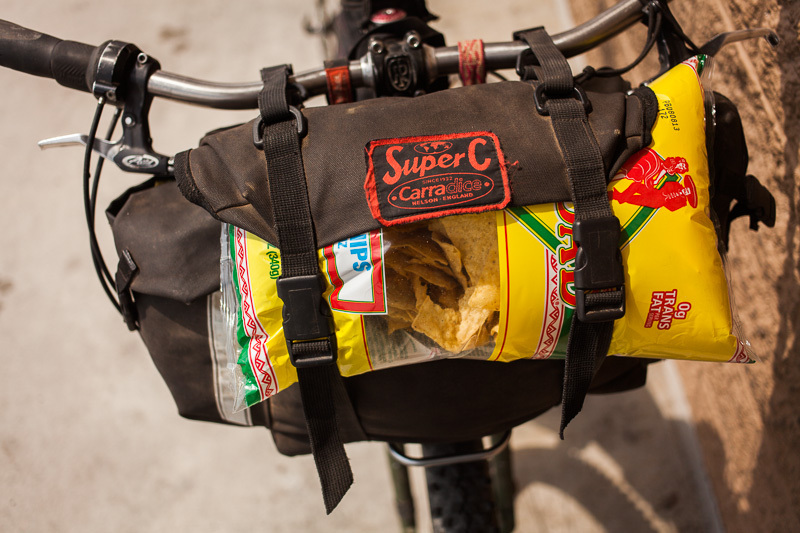 The Super C Saddlebag boasts 23L in capacity. The shape makes for easy access to contents, with two big side pockets. It’s tough, waterproof and easily repaired. There’s buckles to lash on extra gear, if needed. At 880g plus the weight of the rack (280g), it’s a good deal heavier than my Porcelain Rocket handlebar pack (340g). It’s awkward to remove quickly (the easiest solution is to have my valuables nesting in an internal bag). Not ideal for technical mountain biking. The rack could be prone to failure. My journey across the Americas is now over. The Nitto/Carradice worked really well, and proved to be the best solution I’ve found so far to carrying a DLSR and lenses – packed on top of my Patagonia Nanopuff and other clothing. No failures to report, just some small, cheap repairs to the saddlebag en route. Before leaving, I replaced the flimsy strut that comes with the Nitto with sturdier stainless steel plate. The struts were later bent outwards, to accommodate the Surly Pugsley I ended up riding. The bullfrog. Ogre + Rabbit Holes + Rohloff + Porcelain Rocket + Carradice. 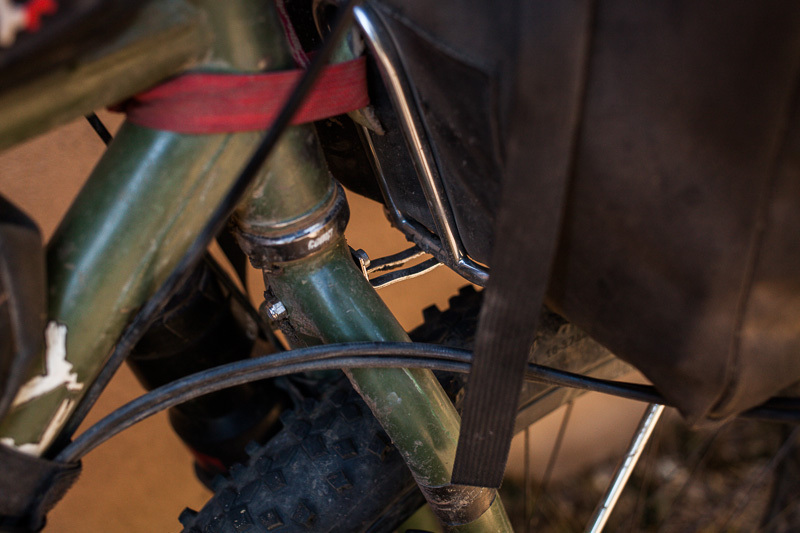 Extra attachment points work well for cinching the bag tightly to the bars when the going gets really rough. 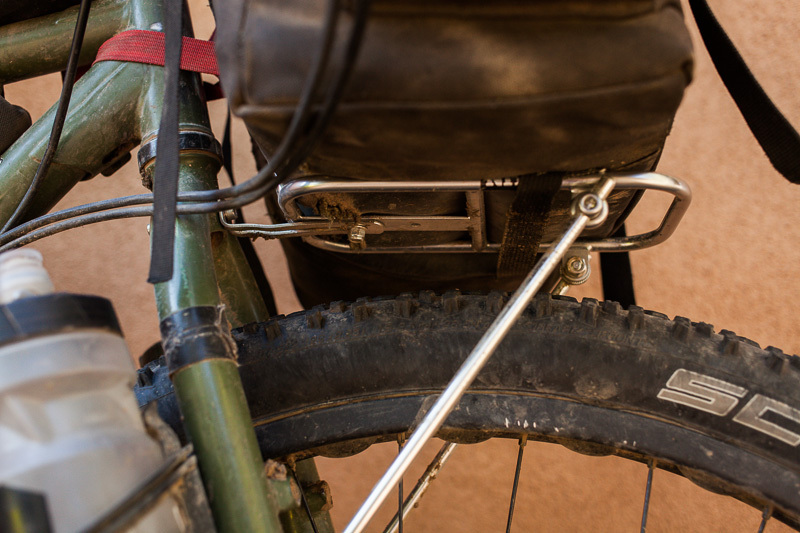 A strap round the headtube helps keep the things in place. Most likely, I’d want to beef up the strut between the rack to the fork bridge – probably with a piece of stainless steel. I made two small incisions to the bag to keep it secure on the rack at the front. These will need to be stitched up. Eventually I’ll add some webbing. Space for water bottle or Anything cages too. Mud clearance isn’t an issue either. And… overflow room for the necessities in life. This entry was posted in Gear and tagged Carradice saddlebag on July 2, 2013 by Cass Gilbert. It’s a very functional solution Cass., will be interested to see how it holds up. I’ve had a lot of fun trying out different ways of loading up my Troll and settled on something similar.I have several pre packed bags now which I can load on the bars as the riding dictates, i do the same with my camera gear, all very Thunderbird 2! It’s hard to beat the simple functionality of Carradice. There’s a real resurgence in saddlebags in the US, from the likes of Swift, Ruthworks SF and Dill Pickle. Incidentally, I just read an interesting review for the EP-5. 1200+ shots from a single charge! Yes just read that review too. Sounds great. Bit pricey for camera and separate EVF combo though (which is essential if you are outdoors). I’d hang on to see how they update the OMD first. I eagerly await its announcement… A long battery life and a 1/8000 shutter speed would be great additions. Thanks for your input. What you says makes sense, I just don’t think I get on with backpacks for longer than a few weeks. Also, the amount of technical trail is relatively small within the context of the whole trip, and more often than not, I embark on bikepacking rides as separate entities. I’m still planning to take a backpack, but one that scrunches down when not in use. That way, I have some extra stowage space when needed, or for walking around own, or I can carry my laptop in it if the going gets really rough. I’m not sold on the saddlebag at the front idea, but I’m pretty sure I’ll take a saddlebag in some form. They’re so convenient to access, and spacious too. The front rack isn’t actually taking the full brunt of the load, as the bag is supported by the bars too, but it’s definitely the thing that would fail if something does go. That said, it’s repairable, and the system would still work without it. Guess what…. I think I’m forgoing SPDs this time too! Can’t wait to see how you get on with the flat pedals. How long will you be in SA? We could still possibly meet up this winter. I won’t pretend I don’t miss SPDs for some kinds of riding, but so far, I’m getting on surprisingly well with flats. I’m planning to get a set of Shimano Saints before I head off. I just did a 3 day bikepacking trip up into the mountains here in BC. I took my packraft so I could pull my bike on the snow if needed, plus I paddled around the lake a bit too. Lots of stuff to lug. It was too hard to pull the packraft+bike across the snow for very far, I’l have to scratch that idea for now. It was a good little training ride for sussing out my gear, I think I’m getting it down now. I’m going to remove my front OMM rack, which is very heavy, and replace with a simple aluminum low rider support brace, which is basically just an elongated upside down U that goes over the wheel. I’ll brace this at the brake bosses and this functions as a second vertical post, which means I can just wedge my thermarest up against this and the shock leg, and strap it on. On the other side I can put on a similarly sized bag of stuff. And I’ll get some of those rubber coated hose clamps and try to bolt on water bottle holders on the more rear facing side of the fork legs. Plus I can put something small on the part of the U that goes over the wheel. I got a Tarptent Moment which is great, although I already broke one of the carbon fibre pole sections (they don’t bend like aluminum!) This hangs nicely off my handlebars. My Nikon V1 fits perfectly inside my Revelate Gas Tank, with the lens cap off and pointing up, ready to go. My larger long lens DSLR fits in a small backpack hanging off my chest. This stays cool because it hangs away from my chest, that makes a big difference. I should be getting some Mountain Feedbags in the mail soon, those will hold some extra goodies. In the rear I still have a rack, as I’m going to be taking my packraft with me most places. That goes on top of the rack. On one side of the rack I strap my sleeping bag, and on the other I still have a small pannier. I’d like to try to get rid of that too, we’ll see how that goes. And I have a frame bag too. It’s all coming together nicely, I’m surprised how little space things take when you really try. I devised a small Trangia / Clikstand based cookset that can handle a litre of water. I should start selling them as I haven’t found a good pot solution to the Trangia stove theme. I sold my Mukluk to my friend in California, we went on a Baja trip a month ago and it was great for riding the beaches and dunes, he loves it. He was asking if I know of any used ones for sale and I said I’d sell it to him! I want an IGH so I think I’ll buy a Pugsley frame and build it up with an Alfine 11 speed. Actually what was scary was that we didn’t have a proper bike rack and we just strapped it to the front rack of the truck. I thought I put padding in all the places but I missed one spot and it rubbed a big gauge in the aluminum. Luckily it wasn’t in a vulnerable spot so no real damage was done but that’s pretty scary. I think I’ll go back to steel… But my friend doesn’t care, he will enjoy the bike. Plus now he has a fatbike so if this December we can attempt a descent of the Salsipuedes canyon he`ll already have a bike ready to go. Also, have you heard of this Sawyer Squeeze water filter? It is really small, and an obvious idea when you think about it. The filter is good but apparently the bags degrade quickly from being squeezed. In August I’m going on a solo 8 day bikepacking / packrafting trip through the wilderness of the Chilcotin mountains here in BC. It will start with a hike-a-bike up into the alpine (the mining road almost reaches the alpine, it’s only a km further to go), then across some moraine for 7 km to a glacial river valley which I can packraft down another 10 km (at least that’s how it looks in Google Earth), then a bit of bushwhacking down to the main river valley of the Lord River which flows 20 km into into Taseko Lake. From there a more used biking trail brings me back through a series of valleys and lakes to complete the circuit. Should be a lot of fun. The opportunities for that kind of riding in the Chilcotin are endless, it’s so fun to pull up Google Earth and devise a scheme. But you only have about 3 – 4 months of opportunity a year. Wow, Mark. Sounds like you’re really getting into the packraft scene. It’s something I’d love to try out at some point. I’m definitely delighted with my Rohloff, and having given derailleurs another go last year, I’m pleased to be reunited with it. A Pugs/Alfine sounds great, though I expect there’s a weight penalty over your Mukluk. Thanks for the heads up on the Sawyer Squeeze. I’ll have to go check it out in my local REI. Right now, I’m leaning towards getting a Steripen Freedom. I managed to get all the way through South America without the need for a filter before (I have a robust stomach) but if Nancy and Sage are to come and meet up with me, I’ll need to have a system for them. I’m not sure I’ll be able to get a dynamo hub built up in time, so I have to decide on whether to carry a solar panel or not. Again, it’s not something I’ve needed previously, but it would be useful to keep the iphone juiced up – and it would charge the filter too. Interesting solution, but looks a little front heavy to me. And as you say, prone to front rack failure at some juncture. The largest, flattest area to site a laptop on your bike, (Carradice aside), would surely be in the frame bag? I don’t know the precise dimensions of your laptop, (around 30 x 20cm), nor of your bike frame/frame-bag, and I’m guessing that you’ve already been down this route, but if you had a slender map pocket covering one whole side of the frame bag, (which you may or may not have as I know yours is a custom bag), that might be an ideal place? You’d have to bear it mind when packing other stuff in the other side of the frame bag. You’d probably have to add some padding, a silicone/neoprene cover. If you were worried about side impacts, maybe some strips of Ti pot shield inside the frame bag as reinforcements might help? Just in terms of the shape and available space, it makes sense. On a vibration level it’ll always be more stable in the centre of the bike, (tho’ I guess the ‘hanging’ aspect damps vibrations in the handlebar and seat packs). But perhaps it just doesn’t fit? If so, it can’t be far off. Perhaps Eric/Scott of Revelate/Porcelain Rocket could make you up a bespoke laptop case that you can velcro to the side of your frame bag in such a way as to have no overlaps? Security issues there with quick theft, certainly, but I’m sure you can travel in stealth mode, make the pack so understated, black and logo free that it looks dull and unappealing. (Andean mud will help with that). Or perhaps you could get a smaller laptop? iPad Mini? (Tho’ not sure if you can run your photo apps with that). Just thought I’d throw that option into the mix to confuse you further! (Feel free to ignore everything I’ve just written). Have been enjoying your recent blogs immensely, particularly re. Sage & Nancy. Thnx. Keep on rolling, you high plains drifter. Thanks for your thoughts! Unfortunately, the Airbook doesn’t fit! (close but no cigar) A frame size up, and it would work. When I had my Thorn Catalyst frame, it fit fine. I’ve already had it for nearly 3 years, so in terms of vibrations, it’s proved really robust – the SSD drive probably helps. So I’m not too worried about that – it’s seen a hard life already. I’ve thought about downsizing to an ipadmini (with a separate keyboard), but as nice as it would be, it just doesn’t do what I need. Yet – I’m always keeping an eye on them. Before the days of netbooks, I just used internet cafes to work. But having a decent laptop has proved really useful, so would be hard to give up. And Macs are just so nice to use. I have followed your blog for some time,first time reply .I am also from the UK living in NY for 20 years .I will cut to the chase ,my friend is a pro MTB mechanic and does not rate the Saints very highly. I would look at the Straitline pedals super strong and can be rebuilt with minimal tools in 5mins or the Hope pedal range .These pedals are flat and will take what ever you throw at them .Second send me a sketch of that bracket that holds the rack and I will make you a new one out of stainless .I work in an experimental machine shop .Incidently the Straitline pedals come with a rebuild kit ,I have them and love them .Lastly I always wanted to ask you! , have you had any problems with people trying to rob or mug you in these countries down south . Hey Jeff, thanks for your advice. I’m pretty new to flat pedals, but basically I’m after something that’s concave, wide but not too deep. As it happens, I literally just ordered some Saints. A friend bought a pair, and I liked the look of the shims to adjust screw heights (and the ease of replacing them), so I figured I’d go for it. I did hear the Straitlines were really nice, and the Hopes too – but both are a chunk more expensive, and I wondered if they might be overkill for my touring needs. And I read some good stuff on the DMR Vaults. But… the Saints worked out pretty cheap, so if they’re not right, I guess I’ll bite the bullet on one of those. Any advice on shoes? I’m looking at 5.10 and Teva. I’m after something that’s not too heavyweight (so they don’t take long to dry). Grippy but hardwearing. Basically, shoes I can hike around in too. No one has anything in stock here – and I’m not really a fan of buying shoes online – which makes finding the right ones tricky. So far, I’ve not had any safety worries down south. There were a few spots in Honduras that were sketchy, but that’s about it. I’m pretty careful – I don’t flash around gear. And I tend to keep to mountain backroads, rather than big cities and the coastline, where the communities are more welcoming. In fact for the most part, I’d say I’ve been more struck by how warm and welcoming people are in Latin America than any safety worries. I’m a big believer in bikes for breaking down barriers. Thanks for the offer of machining up a bracket. I’m still figuring out if I’m going to load the saddlebag up front. But if I do, I’ll definitely be in touch. thanks for the reply ,re the shoes try this one( Keen Commuter III Cycling Shoe ). Its what I would use ,if you can locate a retailer of Keen shoes and try your size on any pair to see how the fit is it should lessen the worry of ordering on line the style you need .I like their shoes they have a Danish flair about them no cramping and a more rugged than Teva’s . What happened to your Hold Fast straps, did you not get on with them? I like them a lot. Just not for ‘proper’ mountain biking – as they’re death traps with grippy pedals. I’ll most likely take them away with me, and just pull them off when I go ride some trails. Also have you seen these? I just got two and the post mount Monkii Clip version. As I’m UK based I got them from Cycle Miles, he was fantastic, really friendly and great service/advice. 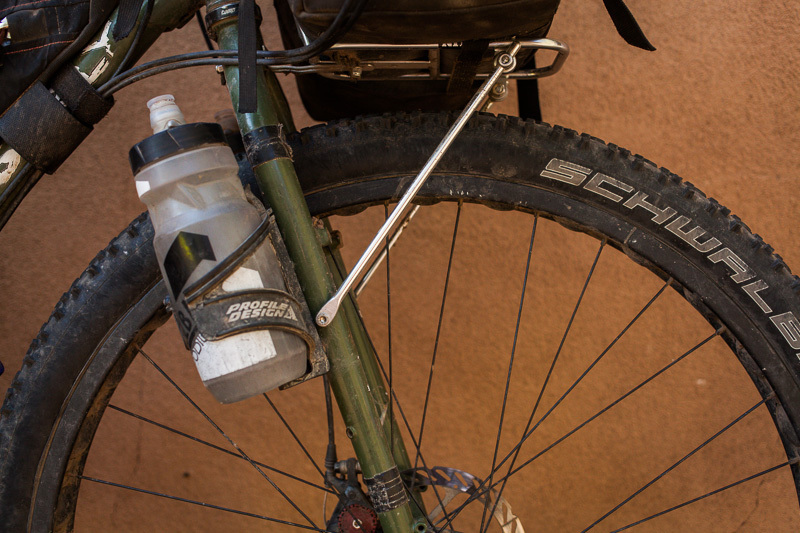 Suggested the v version as they’re better for bikepacking, more sturdy attachment style. Pretty much Salsa anything cages style. they’re always really well thought of on singletrack forum etc. Thanks for the links Wilbur. Looks like a modern rendition of the Bike Buddy (http://www.bikebuddy.co.uk/). I’d like to check them out some time. I needed more room for commuting. Loved my Carradice Barley but too small. Switched to a Nelson Longflap but then the bag, when full, rested on my fender too much. Luckily I live near Rivendell and they have a very light (11oz. ), Nitto rack which you can install front or back. Installed it in the back; perfect! I think that’s the Nitto Mark. Pricey, but nice looking. And as you say, very versatile. You typically ride with a larger front load than I prefer, so the handling may not be that unfamiliar to you. However, I think some of the magic of my rear mounted saddlebag is that the weight is tucked behind the saddle, but in front of the rear axle, and as low over the tire as possible. It seems your front bag, when overloaded, will stray beyond the front axle and further from the steering axis. When mounted in the rear– and you may find some extra room for an additional dry bag in between sadlebag and seatpost– the weight of the load is felt, but no greater heft is imparted on the ‘ride’. Without feeling too-light in the front, my bike is capable of a useful trail-wheelie, to engage an obstacle. I presume you can do the same with the bag up front, as you are strong. 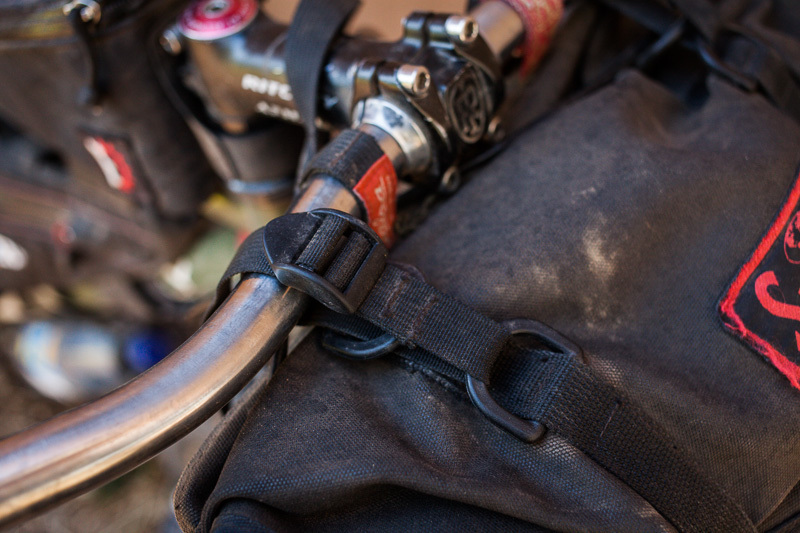 However, a rear mounted bag will solve any of your handling concerns. It may be a challenge to attach the bag properly to the saddle without bag loops, but I vote for some experimentation with a similar system at the back end of the bike. Longer struts are available for the rack to use existing mounting points. Perhaps you could even mount to the canti studs with some engineering. Thanks for your thoughts, Nicholas. I probably should have explained, but I wasn’t intending to run the Carradice solely at the front – the plan was (or perhaps still is) to team it with my Nelson Longflat at the back – if I can retrieve it from where it languishes in the UK. This would be set up à la GBT, using a minimal rear rack and a Bagman QR clamp, or perhaps using the Bagman2 Expedition Support. Saddlebags run at both the front and rear would give me some 48L in capacity (plus Longflat potential and framebag): space which would be easy to access, and almost completely watertight, and laptop/camera friendly too. Having just ridden a few days of the Colorado trail, the setup seems pretty secure, and (as you mention) probably no heavier than I normally run things up front. So far so good. I just need to get hold of my other bag to complete the experiment. Heading east out of the EU for a change of scenery. Probably cross paths with Joe later this week. What is the name of the red seat bag? I have been reviewing several brands but I do not recognize the one on your bike. That would be Porcelain Rocket’s Booster Rocket seat pack. Light, minimal and very nicely made. When using panniers my bike tends to flex (noodling) quite a bit when I get out of the saddle, I am curious if using a seat bag (like the Booster Rocket) will reduce this type of flexing. Seems like the seat bag would cause the frame to flex less, since it is mounted to the seat post and the seat tube area has so much reinforcement (seat tube, seat post, seat stays and top tube). Can you compare how your bike handles with panniers vs the Booster Rocket seat pack? Seat packs waggle around a bit, but not enough that I ever notice it when I’m riding. However, I only pack mine with relatively light stuff – generally my tent plus waterproofs, along with some food. As the capacity (up to 14L) is way less than panniers, by default there’s no real effect on the frame, so I guess it’s hard to compare. Certainly, if you spread your cargo across the bike with a seatpack, framebag and rollbag on the handlebar, handling is great. And, this kind of slim setup makes carrying it a lot easier too. I’m thinking of running a similar setup up front with the Carradice for an upcoming tour. Have you had any problems with the bag sagging over the edges of the rack? I was thinking about trying to rig up some sort of internal frame in the bag…. not sure yet. I guess it might not be an issue if I have it strapped to the handlebars and rig up some straps like you did to mount it to the rack. Your pictures don’t seem so show much “sag.” What do you think? By the way, I love the blog. One of my favorites to check out! I placed a piece of Thermarest Ridgerest, cut to shape, to give the bag shape, and provide some protection for my camera and gear. So far, so good. Also, I added in some webbing below the saddlebag, so it can be attached directly to the rack, and cinched in from above via the handlebars. (I replaced the Carradice leather strap with some nylon ones, and run a second set of straps round the plastic buckles so it holds fast). It takes a little adjustment initially to avoid fouling the brake levers, but works great, with no movement from side to side.